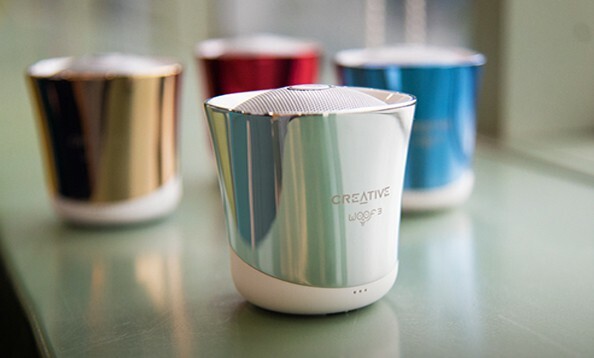 Creative Technology Ltd today announced the Creative Woof 3, the ideal micro-size Bluetooth speaker companion for smartphone and tablet users who want to enjoy their music out loud on the go, ideal for users who appreciate both great aesthetics and audio. Shaped like an inverted bell, the speaker produces clear audio that is directed upwards and well distributed. Encased within the durable premium metal alloy housing is a 45mm driver (12% larger than its predecessors in the Woof series), and an additional oversized passive bass radiator for an enhanced audio performance. It even doubles up as a speakerphone with its built-in invisible microphone when connected via Bluetooth with a smartphone. Also supports MicroSD card playback of songs in lossless high quality WAV/FLAC/APE formats.